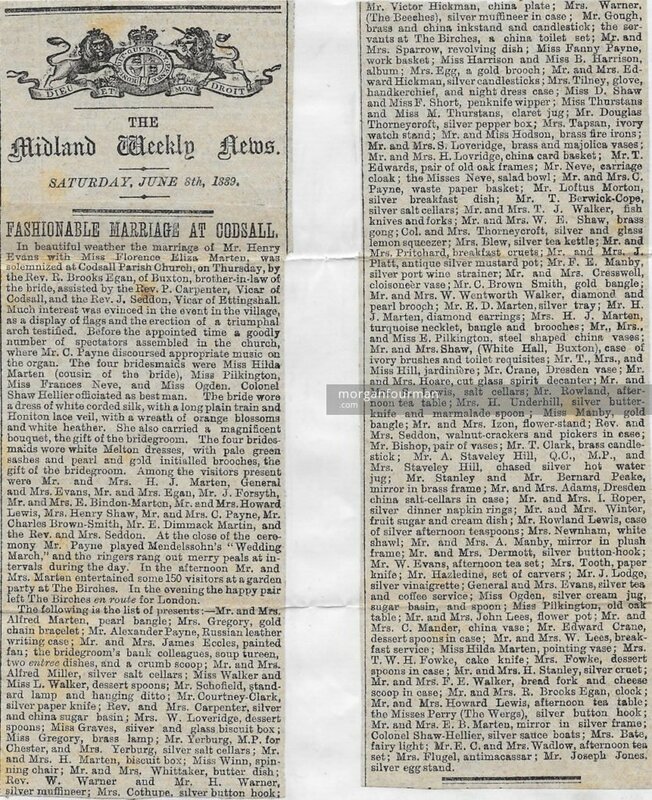 Newspaper report of the marriage of Mr Henry Evans with Miss Florence Eliza Marten on Thursday 6 Jun 1889 was published in the The Midland Weekly News. This cutting was kept in our archive. In beautiful weather the marriage of Mr. Henry Evans with Miss Florence Eliza Marten, was solemnised at Codsall Parish Church, on Thursday, by the Rev. R. Brooks Egan, of Buxton, brother-in-law of the bride, assisted by the Rev. P. Carpenter, Vicar of Codsall, and the Rev. J. Seddon, Vicar of Ettingshall. Much interest was evinced in the event in the village, as a display of flags and the erection of a triumphal arch testified. Before the appointed time a goodly number of spectators assembled in the church, where Mr. C. Payne discoursed appropriate music on the organ. The four bridesmaids were Miss Hilda Marten (cousin of the bride), Miss Pilkington, Miss Frances Neve, and Miss Ogden. Colonel Shaw Hellier officiated as best man. The bride wore a dress of white corded silk, with a long plain train and Honiton lace veil, with a wreath of orange blossoms and white heather. She also carried a magnificent bouquet, the gift of the bridegroom. The four bridesmaids wore white Melton dresses, with pale green sashes and pearl and gold initialled brooches, the gift of the bridegroom. 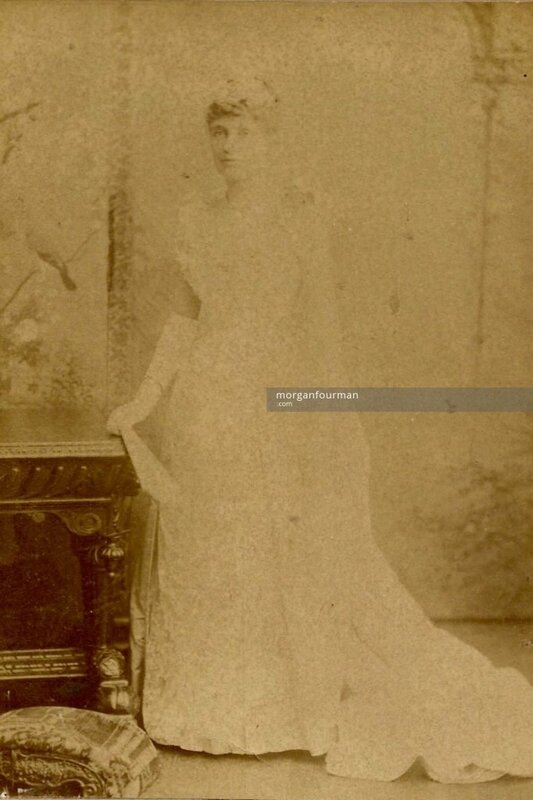 Among the visitors present were Mr. and Mrs. H. J. Marten, General and Mrs. Evans, Mr. and Mrs. Egan, Mr. J. Forsyth, Mr. and Mrs. E. Bindon-Marten, Mr. and Mrs. Howard Lewis, Mrs. Henry Shaw, Mr. and Mrs. C. Payne, Mr. Charles Brown-Smith, Mr. E. Dimmack Marten, and the Rev. and Mrs. Seddon. At the close of the ceremony Mr. Payne played Mendelssohn’s “Wedding. March,” and the ringers rang out merry peels at intervals during the day. In the afternoon Mr. and Mrs. Marten entertained some 150 visitors at a garden party at The Birches. In the evening the happy pair left The Birches en route for London. The following is the list of presents :- Mr.and Mrs. Alfred Marten, pearl bangle; Mrs. Gregory, gold chain bracelet; Mr. Alexander Payne, Russian leather writing case; Mr. and Mrs. James Eccles, painted fan; the bridegroom’s bank colleagues, soup tureen, two entree dishes, and a crumb scoop; Mr. and Mrs. Alfred Miller, silver salt cellars; Miss Walker and Miss L. Walker, dessert spoons; Mr. Schofield, standard lamp and hanging ditto; Mr. Courtney-Clark, silver paper knife; Rev. and Mrs. Carpenter, silver and china sugar basin; Mrs. W. Loveridge, dessert spoons; Miss Graves, sliver and glass biscuit box; Miss Gregory, brass lamp; Mr. Yerburgh, M.P. for Chester, and Mrs. Yerburgh, silver salt cellars; Mr. and Mrs. H. Marten, biscuit box; Miss Winn, spinning chair; Mr. and Mrs. Whittaker, butter dish; Rev. W. Warner and Mr. H. Warner, silver muffineer; Mrs. Cothupe, silver button hook; Mr. Victor Hickman, china plate; Mrs. Warner, (The Beeches), silver muffineer in case; Mr. Gough, brass and china inkstand and candlestick; the servants at The Birches, a china toilet set; Mr. and Mrs. Sparrow, revolving dish; Miss Fanny Payne, work basket; Miss Harrison and Miss B. Harrison, album; Mrs. Egg, a gold brooch; Mr. and Mrs. Edward Hickman, silver candlesticks; Mrs. Tilney, glove, handkerchief, and night dress case; Miss D. Shaw and Miss F. Short, penknife wipper; Miss Thurstans and Miss M. Thurstans, claret jug; Mr. Douglas Thorneycroft, silver pepper box; Mrs. Tapsan, ivory watch stand; Mr. and Miss Hodson, brass fire irons; Mr. and Mrs. S. Loveridge, brass and majolica vases; Mr. and Mrs. H. Loveridge, china card basket; Mr. T. Edwards, pair of old oak frames; Mr. Neve, carriage cloak; the Misses Neve, salad bowl; Mr. and Mrs. C. Payne, waste paper basket; Mr. Loftus Morton, silver breakfast dish; Mr. T. Berwick-Cope, silver salt cellars; Mr. and Mrs. T. J. Walker, fish knives and forks; Mr. and Mrs. W. E. Shaw, brass gong; Col. and Mrs. Thorneycroft, silver and glass lemon squeezer; Mrs. Blew, silver tea kettle; Mr. and Mrs. Pritchard, breakfast cruets; Mr. and Mrs. J. Platt, antique silver mustard pot; Mr. F. E. Manby, silver port wine strainer; Mr. and Mrs. Cresswell, cloisonné vase; Mr. C. Brown Smith, gold bangle; Mr. and Mrs. W. Wentworth Walker, diamond and pearl brooch; Mr. E. D. Marten, silver tray; Mr. H. J. Marten, diamond earrings; Mrs. H. J. Marten, turquoise necklet, bangle and brooches; Mr., Mrs., and Miss E. Pilkington, steel shaped china vases; Mr. and Mrs. Shaw, (White Hall, Buxton), case of ivory brushes and toilet requisites; Mr. T., Mrs., and Miss Hill, jardiniere; Mr. Crane, Dresden vase; Mr. and Mrs. Hoare, cut glass spirit decanter; Mr. and Mrs. S. Lewis, salt cellars; Mr. Rowland, afternoon tea table; Mrs. H. Underhill, silver butter knife and marmalade spoon; Miss Manby, gold bangle; Mr. and Mrs. Izon, flower-stand; Rev. and Mrs. Seddon, walnut-crackers and pickers in case; Mr. Bishop, pair of vases; Mr. T. Clark, brass candle-stick; Mr. A. Staveley Hill, Q.C., M.P., and Mrs. Staveley Hill, chased silver hot water jug; Mr. Stanley and Mr. Bernard Peake, mirror in brass frame; Mr. and Mrs. Adams, Dresden china salt-cellars in case; Mr. and Mrs. I. Roper, silver dinner napkin rings; Mr. and Mrs. Winter, fruit sugar and cream dish; Mr. Rowland Lewis, case of silver afternoon teaspoons; Mrs. Newnham, white shawl; Mr. and Mrs. A. Manby, mirror in plush frame; Mr. and Mrs. Dermott, silver button hook; Mr. W. Evans, afternoon tea set; Mrs. Tooth, paper knife; Mr. Hazledine, set of carvers; Mr. J. Lodge, silver vinaigrette; General and Mrs. Evans, silver tea and coffee service; Miss Ogden, silver cream jug, sugar basin, and spoon; Miss Pilkington, old oak table; Mr. and Mrs. John Lees, flower pot; Mr. and Mrs. C. Mander, china vase; Mr. Edward Crane, dessert spoons in case; Mr. and Mrs. W. Lees, breakfast service; Miss Hilda Marten, pointing vase; Mrs. T. W. H. Fowke, cake knife; Mrs. Fowke, dessert spoons in case; Mr. and Mrs. H. Stanley, silver cruet; Mr. and Mrs. T. E. Walker, bread fork and cheese scoop in case; Mr. and Mrs. R. Brooks Egan, clock; Mr. and Mrs. Howard Lewis, afternoon tea table; the Misses Perry (The Wergs), silver button hook; Mr. and Mrs. E. B. Marten, mirror in silver frame; Colonel Shaw-Hellier, silver sauce boats; Mrs. Bate, fairy light; Mr. E. C. and Mrs. Wadlow, afternoon tea set; Mrs. Flugel, antimacassar; Mr. Joseph Jones, silver egg stand.